Poor center post connection is a recurring issue that new as well veteran electronic cigarette users often encounter. When an electronic cigarette atomizer and battery are both working properly, but will not produce any vapor, the center post may be the problem. Sometimes it will result in an atomizer only working with one battery or vice versa. Both the electronic cigarette battery and the atomizer or cartomizer must make a positive and negative connection through the threaded connector. The positive connection is made through the center post, while the negative is made through the threads on the outside. The two are separated from each other by a rubber ring, and therein lies the problem. Because that ring is flexible, the center post can sometimes get pushed down too far to make good contact with the center post of the atomizer. The same thing can happen to the center post of an atomizer or cartomizer. Each time it is screwed onto the battery it pushes the center post in a little and even combinations that once worked well together will sometimes lose connection. Fortunately, pulling the center pin out a little on either component usually resolves the issue. The following information refers to a cartomizer, but applies to atomizers as well. Before trying to adjust the center post, it is a good idea to make sure that the electronic cigarette battery and cartomizer are indeed working properly. If the battery works fine with another cartomizer and the cartomizer works well with another battery, then both are working fine. A more accurate assessment involves the use of a multimeter, which is a good tool for any electronic cigarette user to have. Inexpensive examples are available at Walmart and Harbor Freight Tools. 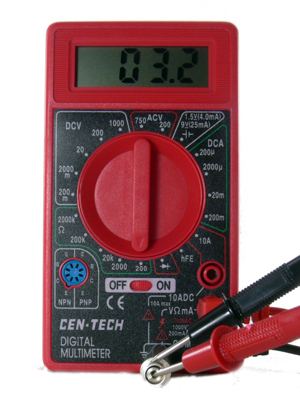 The DC Voltage (DCV) function can be used to check that your battery is producing the correct voltage when the button is pressed by holding one probe on the outside threads and touching the other to the center post. Be careful not to touch both the center post and the outside threads with one probe which will short out the battery. Checking to see whether a cartomizer is working involves checking the resistance with the 200ohm (Ω) function on the multimeter. 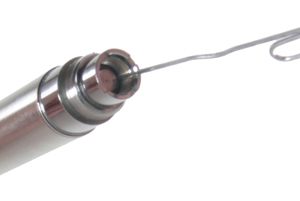 When the one probe is touched to the center post and another to the outside threads, the reading should be somewhere between 1.5Ω and 5.0Ω depending on the cartomizer being used. If the display doesn’t change, the cartomizer is likely bad and should be discarded. If the resistance is extremely high, the cartomizer may have shorted out and may short out a battery if used. Once it has been determined that both components of the electronic cigarette are good, but not working together, it is time to try prying up the center post. 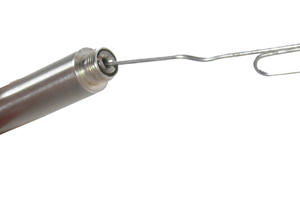 Using a paper clip or similar object inserted into the center hole of the cartomizer, gently move the center post back and forth while trying to work it further out. Many cartomizers will have a groove in the center that looks like it is made for adjustment with a flat head screwdriver – it is not, and rotating the center post will eventually result in breaking the positive connection inside. Prying from the outside edge of the center post will also work if there is no center hole, but be careful not to damage the silicon ring below it. The same approach can be used on the battery by gently prying out the center pin. Again, be careful not to damage the silicon ring under the center pin and also make sure to avoid pressing the button when touching both the center pin and outside threads with the paper clip. This method will resolve many of the poor connections that often result in vapers throwing away perfectly good electronic cigarette components. Hopefully they’ll work for you! Also, if a paperclip doesn’t work, a knife tip is thinner and a lot more effective. Just got a new atomizer delivered today and it wasn’t working. Found your website and the paper clip method on the atomizer worked a treat. Excellent advise! Thank you! My brand new battery wasn’t working w/ an atomizer, but worked just fine with another atomizer and vice versa. Your trick helped me to fix the connection problem between battery and atomizer. Thank you! best v4l battery for tank use?